I woke for our second full day of work to sprinkles. Just a hint of them, but definite sprinkles, which was of some concern for me since I had failed to set up my tarp. It wasn't supposed to rain! Rather than set up my tarp, I just pulled out my tarp and threw it over me. We were planning to break camp and move up to Solo Tarn to be closer to the work, so setting up the tarp just to break it down in an hour seemed counter-productive. I just hoped it wouldn't start raining hard and crossed my fingers. It didn't stop raining hard, though, and eventually the sprinkles stopped, and I got up. I ate breakfast (granola cereal) and packed up camp. I didn't move quickly, though. Marcella planned to bring up the rear of our group to make sure no stragglers got left behind and Larry was never far from her, so I knew Team Buzzsaw would be running later than all of the other groups. I did go ahead without them, but I was still one of the last people to leave camp. I wandered up the trail, hiking alone, and made it just past the avalanche shoot when I saw a tree fallen across the trail. It was hard to miss: on the slope to the right, but the end stuck about chest high over the trail. 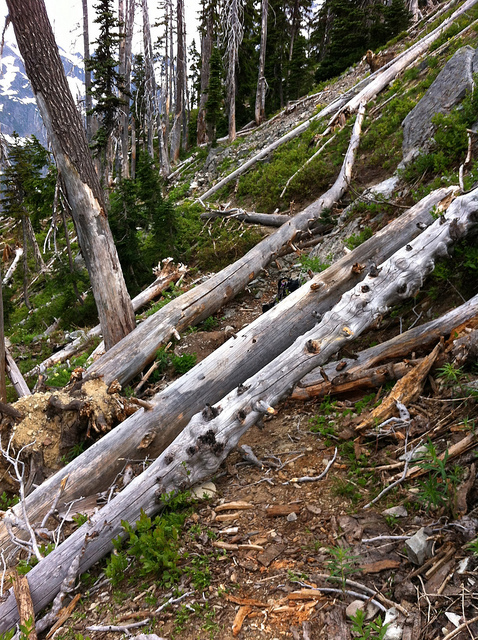 We had cleared this section of trail of fallen trees already--this tree had not been here when I hiked down the day before. How utterly inconsiderate of the tree to fall down in the middle of the night. Most of our group had already walked past this tree, but I wasn't surprised that they didn't stop to cut it out--all of our tools were still up the mountain where we had stopped working the day before. They couldn't cut it out even if they wanted to without their tools, and I started continuing ahead then stopped in my tracks. I actually did have tools. I wanted to cut a couple of small branches on my way back to camp the day before so I carried the Corona handsaw, my hardhat, and my gloves--possibility making me the only person who actually had all of the required equipment in order to work. I turned back around and studied the tree closer. It was a rather large tree for a Corona--if we had a cross-cut saw, we'd probably have used that--but it did look small enough to be doable with a Corona. I walked around the fallen tree. It looked like it had been dead for quite some time and snapped off from a snag on the uphill side of the trail. The snag still stood upright. I looked in the trees above and didn't see anything remotely dangerous about the work location. With the end of the log dangling in mid-air, I knew I wouldn't have to worry about the saw binding as I cut down into the log. It was also small enough that I didn't have to worry about it rolling or falling and hurting me. All-in-all, I decided, this tree looked positively easy. I could totally do this. It was practically a setup for a one-man job. Or maybe they wouldn't compare notes, and when we came out the next day, the folks who saw the log would expect "one last log" to cut out near the avalanche shoot, then be baffled with it was mysteriously cut out already. Perhaps they'd blame it on tree fairies or something. Another mystery for the ages. (Or at least until they read this blog!) I rather liked the idea of doing that. But it meant I had to work quickly and finish before anyone caught me cutting the tree out. work that Joanna walked up on me. I took a couple of before photos, pulled out the Corona saw, and started sawing. The sawing went quicker than I expected considering the size of the log, but I worked hard trying to finish before anyone walked up on me. After about ten minutes of cutting, the log started "talking"--creaking, clearly about to break at any second, then I started cutting with just the very tip of the saw in short strokes. (I don't want to get the whole blade caught up as the log crashed to the ground.) And finally, CRACK! The log broke loose and crashed to the ground. Perfect! I took off my gloves and went to take a couple of "after" photos when Joanna walked up on me. Damn! So close to getting away with it! She looked at me, with a kind of curious expression. "Admiring your handiwork?" she asked. "Yeah, well, something like that...."
I don't think she realized that I had just cut out that log--perhaps she thought it was a log I cut out the day before--but she certainly looked at me suspiciously. Probably because I still had a hardhat on and had taken off my pack in the trail. If I just wanted to take photos of my work, I wouldn't have had to put on the hardhat or taken off my pack. Joanna joins my "secret tree fairy society"
I packed up my tools, put my hardhat back in my pack, and we started back up the trail. I caught up with the rest of the folks ahead of me several miles up the trail where they stopped where we had cached the tools the night before, and I "complained" bitterly about that "inconsiderate" tree that had the indecency to fall over the trail overnight (but, of course, neglecting to mention that I had already cut it out and enjoyed every minute of it). I waited there for the rest of Team Buzzsaw to catch up, which took a little over an hour, and we all started moseying to the top of the ridge to Solo Tarn--our destination for camp. We didn't plan to stop and cut out any of the trees along the way. 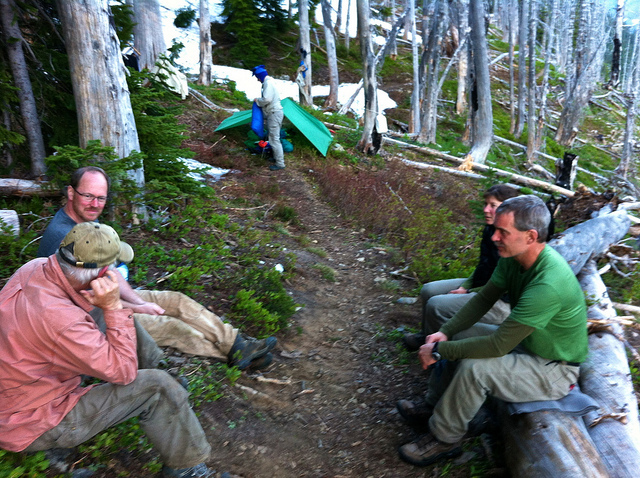 Our goal was to get to the top and set up camp, and along the way we'd get a better sense of how much work was left to free the trail of fallen trees. After setting up camp, we'd work our way back downhill cutting out the blowdowns. I started counting every tree that was blocking the trail. It didn't matter how large or small the tree was, but I counted it if it actually crossed the trail completely. A few trees poked out into the trail but didn't actually cross it, and I knew we'd have to cut those back further, but I decided not to count them. Hikers would walk past and not even realize the tree was there--these trees didn't block hikers at all, but they would block horses. So basically, I was just counting "hiker" obstacles rather than the horse obstacles. Ideally, we'd take care of both types of obstacles, but realistically, if we found ourselves running out of time, it was better to at least get hikers through. Better to block just horses than horses and hikers! Ultimately, I counted 51 fallen trees that fully blocked the trail and an unknown unknown number of trees that partially blocked the trail that would have only caused problems for horses. Combined with the estimated 30 trees our group had cut out the day before, that meant that there were a total of about 80 trees that blocked these few miles of trails, every single one having to be cut out with hand tools. Near the top, we started seeing patches of snow, and at the top--at Solo Tarn--the terrain was blanketed in snow a couple of feet deep. Our destination for the night was completely covered in snow. Solo Tarn, our expected water source, wasn't even visible under all of the snow. We looked around on the ridge to see if we could find anywhere the snow might have melted out where we could set up camp but found nothing. The entire ridge top was covered in a solid layer of snow. be our water source for the camp. As as we arrived, the sky started spitting out a few raindrops. Just the lightest of sprinkles, but the clouds looked mean and we started hearing thunder bouncing around the mountains. We didn't see any lightning, but it was probably just as well we couldn't camp on top of the ridge. It probably wouldn't have been the safest location during a thunderstorm. Worried that the rain might let loose completely, I did set up my tarp in the trail this time and threw all of my gear under it. Then we stopped for lunch. Marcella complained a little that we were already eating lunch and "hadn't cut out a single tree yet." "Don't worry," I told her, "I did cut out one tree. Team Buzzsaw has one tree to its name today." With lunch done, we headed out to finally do some real work for the day. At this point, we were well into an old burn area. This whole area had burned in 1994 in the Waptus Fire, and every year, the dead trees would fall over on the steep slopes blocking the trail. This was the same area I logged out fallen trees back in 2007, and it's a wonderful place to work. Because there are few live trees around, the views are absolutely stunning. 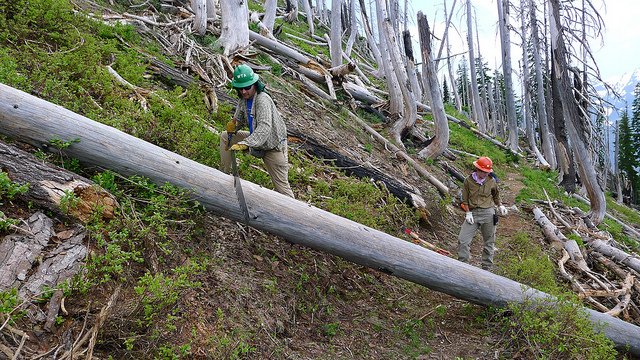 And due to the steep slope and lack of trees, log that are pushed off the trail often times go careening hundreds of feet down the slope turning potential energy into kinetic energy and crashing through the brush, logs and trees with a terrific noise. It's quite satisfying to watch. Please, if you haven't done it already, consider sponsoring me for the WTA's Hike-a-Thon. 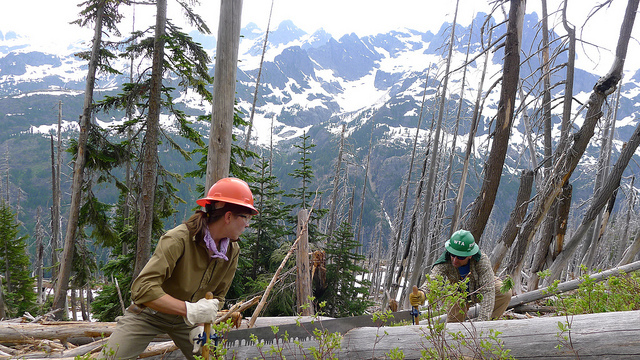 Your contributions go towards trail maintenance projects like this one! Even if you can only contribute five or ten bucks, every little bit helps! Thanks! sure the coast is clear before we push another large log down the mountainside. of it in front of the tarp. Marcella relaxes on the trail. of the damage the trail takes from falling trees each year. Marcella is ready to take over when I get tired of sawing. Marcella and I cutting out another log. What a fantastic place to work!